Olea Villas is a luxury development of two Identical spacious independent villas situated in a four acres piece of land in an olive grove. The villas overlook the beautiful Loutraki bay. Olea Villas is a luxury development of two spacious independent villas situated in a four acres piece of land in an olive grove. The villas overlook the beautiful Loutraki bay. Built in stone, they are an architectural delight featuring airy rooms and large windows. The pastel interiors combine simple elegance and beautiful design with comfort and luxury. 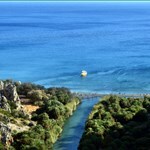 It is located only 170 meters from the sandy, shallow-watered beach of Loutraki. Swimming can be enjoyed in the crystal clear turquoise waters within a lovely sheltered bay. The beach of Loutraki offers sun beds and parasols, a small cafe for simple lunches and a restaurant with authentic Cretan cuisine. Approximately 1.3 km north along the coast is the beautiful Marathi bay with three amazing beaches, several restaurants and a beach-cafe. Two bedrooms with king size beds (can be converted to twin size beds), en-suite bathroom for each bedroom and fitted wardrobe. In between the bedrooms there is a playroom with video games (Xbox 360, Nintendo) and a home theater with a big movie collection. 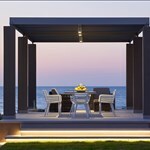 Olea villas situated in Loutraki bay, Chania, Greece are fully equiped villas with a full range of luxury facilities. Our goal is to provide an experiential approach to services in order to satisfy, with true and sincere care, all your needs and desires. If you never want to leave your private pool, you don’t have to. Your only concern should be to relax, dream and enjoy. Crete is the largest and most populous of the Greek islands, the fifth-largest island in the Mediterranean Sea. It is located in the southern part of the Aegean Sea separating the Aegean from the Libyan Sea. It forms a significant part of the economy and cultural heritage of Greece while retaining its own local cultural traits (such as its own poetry, and music). Crete was once the centre of the Minoan civilization (c. 2700–1420 BC), which is currently regarded as the earliest recorded civilization in Europe. 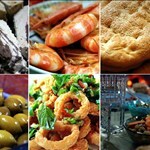 Crete has been established as one of Europe’s most popular holiday destinations. It is renowned for its natural beauty and diverse landscape. Spectacular mountain ranges dotted with caves are sliced by dramatic gorges that spill out to sea. Cretans are proud and hospitable people who maintain their culture and customs, particularly their strong musical tradition. Throughout the island you will come across traditional mountain villages and agricultural settlements unaffected by tourism. An abundance of fresh produce and the distinct Cretan cuisine – renowned for its life-prolonging qualities – adds an interesting culinary dimension. Chania which is only a 20 minute drive from Olea Villas, is the second largest city of Crete and the capital of the Chania regional unit. It lies along the north coast of the island. It is a land whose visitors will experience nature in all its glory and will encounter breathtaking sights. Despite being heavily bombed during World War II, Chania’s Old Town is considered the most beautiful urban district on Crete, especially the crumbling Venetian harbour. Its beautiful Venetian quarter is a web of atmospheric streets that tumble onto a magnificent harbour. Restored Venetian townhouses have been converted into chic restaurants and boutique hotels, while ruins house stunning tavernas. Chania is a place where it is close to impossible to get bored. Amazing beaches, amazing cuisine, amazing excursions, amazing hospitality.